Iniva and A Space are eagerly awaiting the arrival of our third set of Emotional Learning Cards ‘How do we live well with others?’ The new set is currently in production with L&S Printing in Brighton, and last week our designer Therese Severinsen went to see the first copies coming off the presses. We thought we would share a sneak preview of the bold and beautiful new box! ‘How do we live well with others?’ is the latest in our series of Emotional Learning Cards which include 20 cards that combine an image of a contemporary artwork on the front and thought-provoking commentary and questions on the back to stimulate creative exploration. They are designed for use by therapists, educators and parents to guide and inspire reflection on how we think about relationships and make sense of our experiences. ‘How do we live well with others?’ has been developed to raise awareness of our similarities and differences and their effect on our understanding of others addressing questions such as: What has influenced who we are now and how do we make sense of who we are becoming? What are the conscious and unconscious impacts of history, memory, class, race, culture, gender, family and society on our perceptions of ‘self’ and ‘other’? This set features artwork by artists including Sonia Boyce, MBE, Tania Bruguera, Shirin Neshat, Yinke Shonibare, MBE and Ai Weiwei. 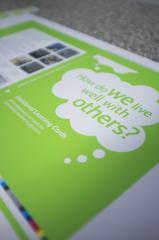 Over the winter the Iniva Creative Learning team has been busy putting the final touches to ‘How do we live well with others?’ which follows in the successful footsteps of ‘What do you feel? and ‘Who are you, where are you going?’ adding new questions and discussion points by Lyn French of A Space to Set 1 ‘What do you feel?’. How do we live well with others? will be launched at a celebration on 3 April and on sale by late March. For more information on the new set and an invitation on the launch please email: jenny@inivacreativelearning.org.